This pincer (sometimes called "Magic Dirk") is undoubtedly severe, but joseki for it have taken a long time to develop (it has been adopted much more slowly than the Magic Sword). For a time it was principally associated with Otake Hideo: that was back in the 1970s. 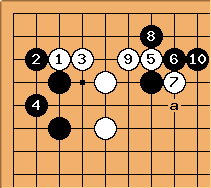 There has been some recent research giving new joseki. 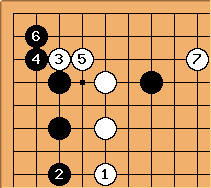 This joseki receives only two pages, comprising a total of seven diagrams, in Ishida's Dictionary of Basic Joseki. 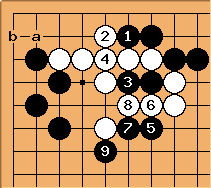 It is not covered in Essential Joseki, Jungsuk in Our Time, Whole Board Thinking in Joseki or 38 Basic Joseki. For many years it was assumed that a here is the only reply. 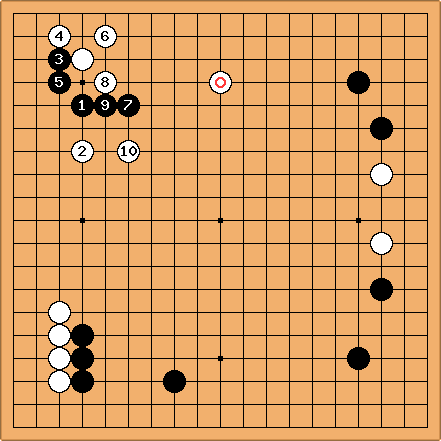 Some games in which White tries b instead have been seen since 2001. If running is bad for white because black has a stone in the way further down the board that white would run into, it's also possible for white to attach immediately at c.
Some whole-board strategies might involve extra considerations. 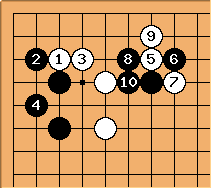 For example, this is one of the pincer if white approaches this way when black has set up a Kobayashi opening. Black is expected to play here. NB that trying to connect under isn't good for Black. Now White a and b are seen. 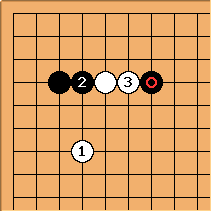 This is one standard continuation, which leads to a running fight on the upper side. White must of course attack, having given Black territory. This is a current idea, with White playing for immediate life; White 11 at a completes a joseki. Alex Weldon: What is the point of here? Clearly, it's to defend against some White move that would hurt Black, or make things too easy to White, but I don't see it. Someone clarify for me? Sorin Gherman: Alex, the purpose of is to both keep pressure on white (prevent him from simply playing hane in sente on top of ) and to make eye shape for black's group in the corner. Dave The direct meaning of here is shown by comparing this diagram and the next one. 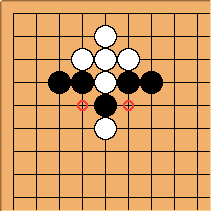 Here if White tries to connect underneath, the marked stone is strong because protects it. Black gets either a or b.
Dave In this case the marked stone is weak. If Black does not protect it, White gets to play at a. Even if Black plays , White can answer at . 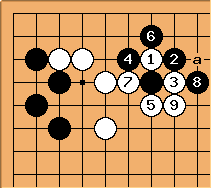 Black has no choice but to retreat to b so White can connect under at c.
Dave Although it seems that White settles her stones in this joseki, there is some bad aji remaining. here is a big move. 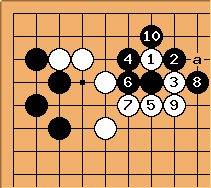 If White plays the seemingly natural reply at , Black proceeds to wall off the left side with through . 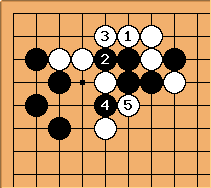 At the end of this sequence White still has only one eye. 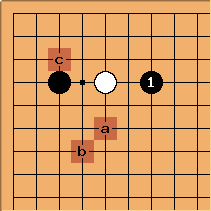 Since does not work well, White may only exchange a for b and turn away. 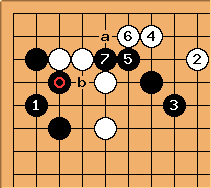 She then has to answer a Black play at 2 but the a / b exchange means that Black can not connect underneath. Dave To my eye playing here instead of descending at 6 looks natural. If Black plays and W answers at , White has settled herself and there is a cutting point left behind at a that may help White in reducing the top. Dave If Black plays then White simply continues with . Black may exchange for but in any case has to go back to capture. 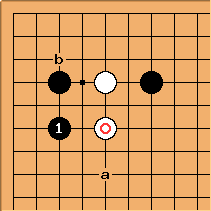 there is still a cutting point at a and Black has ended in gote here. Variation 2 - Just fight? Dave But maybe we are being too easy-going. What happens if White just fights it out with , etc.? These plays are currently being experimented with: provokes , and then White can try another butting play at . 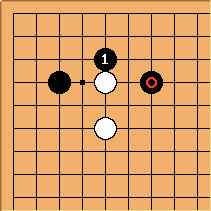 White 1 is used to get a position on the top, typically to counter the effect of a shimari or formations that wants extention on the top. Black 10 at 'a' and the white makes an extention at 'b'. In the second game below, black actually plays 10 at 'c', but 'a' is more common. A dirk is a long straight-bladed dagger. Hence the facetious name. That's why White usually plays a or b instead of . Charles - you state above that connecting underneath is bad for Black. As a novice, the connection underneath would quite possibly be my preferred move here. What are the considerations that make this a poor move relative to the others? 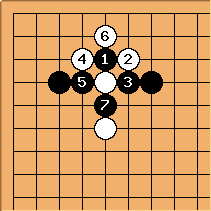 It seems to me that 1 would support if white had a stone positioned near the hoshi point to the right. The wrong choice, but why? Charles I had this played against me once, ages ago. After White connects the ponnuki, for superior shape. That is, is a failure; if is at 4 and White connects at 3 this is like the Bermuda triangle. 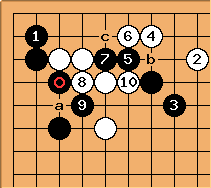 It was 25 years ago, and my opponent David Mitchell had been reading a Japanese joseki dictionary in which this diagram occurred. After the game he went back and translated the comment, 'bad for Black'. What's more he told me this, which is more than some players would do. Those were naive, unspoiled days. the two marked points are cutting points in Black's shape and only one can be defended on the next move.